The logics of social networks to help your company better communicate and work together. Teammee is an Enterprise Social Network platform or Social Intranet, which allows you to introduce innovative ways of communicating, interacting, sharing and collaborating in your company, optimising both individual and team productivity and enhancing work quality. One of our most satisfying moments that we had was when, within a quality circle, an ISTAT executive, shared important decisions, not during the meeting, but through a post on his SistanCommunity. Teammee is an immediately-available Enterprise Collaboration software. Quick and easy to set up, it does not require long implementation times. Teammee easily adapts to all company needs. Set up internal working environments for employees (intranet) and external areas that collaborators, customers, associates and partners can access. 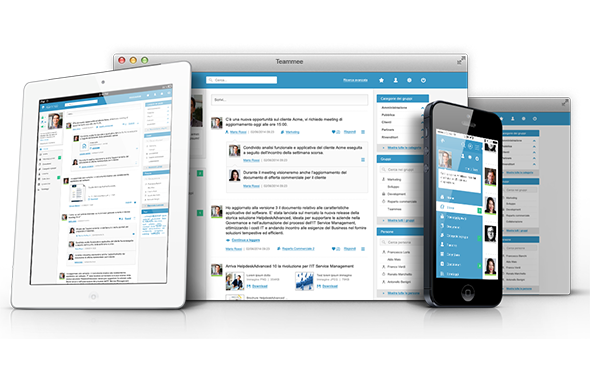 Teammee is designed to integrate with pre-existing company tools such as CRM, help desk software or other platforms. The Teammee software is optimised for viewing on PCs, smartphones and mobiles. Teammee adapts to any company, and is deployable across vast national or international contexts as it is available in all UTF-8 standard supported languages. Teammee has a simply, easy-to-use interface, especially designed for immediate use. It is a user-friendly platform which can be easily used, managed and personalised. Teammee is accessible across all company functions without localisation constraints other than those linked to internet access.